The State alleges that the men had a plan to kill five identified leaders, who had the support of union members. Seven men accused of plotting to kill Amcu leaders in Marikana near Rustenburg are due to appear in the Brits Magistrate’s Court on Friday, to apply for bail. Simphiwe Silwane, Lungisa Madiba, Juke Mjakane, Sthembe Jakane, Xolile Madikane, Mthethelethu Mtshukuka and Zamelekhaya Mboxela through their legal representative told the court last week that they would like to bring a bail application on new facts. 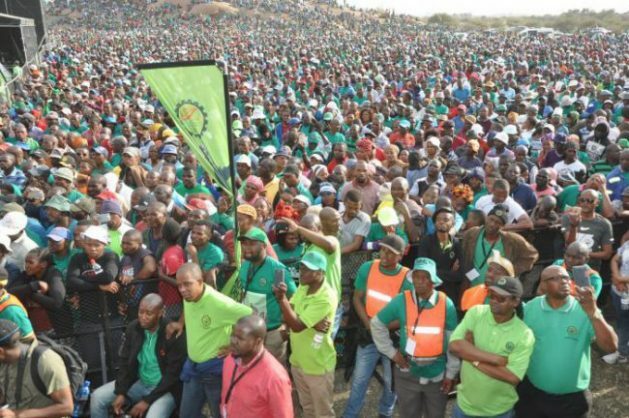 The State alleges that Association of Mineworkers and Construction Union (Amcu) expelled the accused following internal problems in the union, new leaders were elected and the group were not happy that they had been kicked out of Amcu and hatched a plan to kill five identified leaders, who had the support of union members. As part of the conspiracy to commit murder Amcu branch chairman Malibongwe Mdazo was shot and wounded in Mooinooi outside Brits on July 22, 2017 in an attempt to kill him. Warrant Officer Johannes Montsho had told the court the men held several meeting at various places where it was agreed that they should enlist hitmen to killed Amcu leaders.